Just a quick word on shareholder business. It's been about a month since the last shareholder vote. (You can see previous shareholder vote threads and other business-related stuff on the Links page.) We've gotten a lot of new shareholders since then, so I thought I would just say a few things about the voting process. The next vote will take place in the near future. Don't worry, when it happens, I'll send an EVEmail to all shareholders and direct them to the appropriate location. Each share gets one vote, so a shareholder with 10 shares gets 10 votes, etc. Voting will take place either in the designated thread on EVE-O or by EVEmail. When the voting period opens, I'll draft a list of all the shareholders and how many shares they own at that very moment, and that will be the list used for that vote. People will still be able to buy shares, but they won't be able to boost their voting power during that vote. This is unrelated, but I thought you might enjoy this story: You probably noticed Riyal, who wasted no time jumping to the top of the September contributor board, with one of the largest single stock purchases to date. 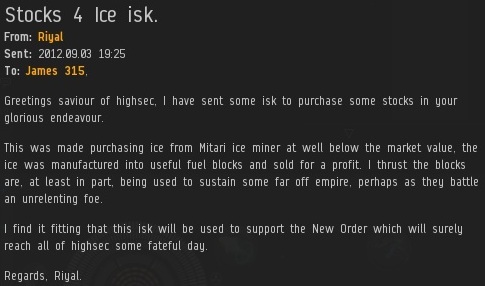 As it turns out, the purchase was inadvertently fueled by a highsec ice miner! Special thanks to the anonymous ice miner who sold ice below market value.